Featuring breathtaking views from the 28th floor of RBC Plaza, this thoughtfully-designed workspace is set to inspire. 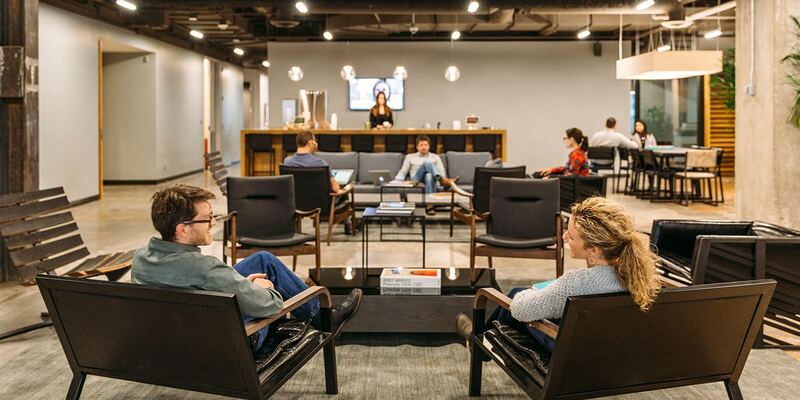 Conveniently located in Nicollet Mall, our office is complete with airy workspaces and best-in-class services and amenities. Christina is a Community Manager at Industrious Minneapolis Downtown. The majority of her career has been spent in hospitality and sales, primarily in the craft beer industry. She grew up in Portland, Maine and went to Bowdoin College where she earned her degree in Government and Legal Studies and Italian. Outside of Industrious, Christina teaches yoga and bootcamp classes throughout the Twin Cities. She loves staying active, New England sports teams, good beer, and her dog, Nucky Thompson. Erin is the Operations Associate for Industrious Downtown Minneapolis. She grew up in La Crosse Wisconsin, but became an honorary Minnesotan when she moved here in 2010. Erin has a B.S. of Civil Engineering and Sustainability from UMN-Twin Cities, and previously worked for a Zero Waste non-profit in Minneapolis. Outside of her role at Industrious, Erin can be found playing roller derby, hosting trivia, or enjoying all the great food (and beer) this city has to offer!